Well, our family has been finished with Halloween for exactly 1 hours. The kiddos are in bed and my mind is in shock that tomorrow is already November 1st. Where did the months go? More importantly, why is it still 85 degrees (definitely not a perk to living in South Texas)? Hot or not, I need to get my mind on Christmas gifts. Last year, was the first year I made myself stick to a really strict budget. I kept up with Christmas ideas, dollar amounts, stores, etc. using a spreadsheet on my computer. It was so helpful that I continued it this year. For the past twelve months I have kept track of gift ideas for my loved ones. 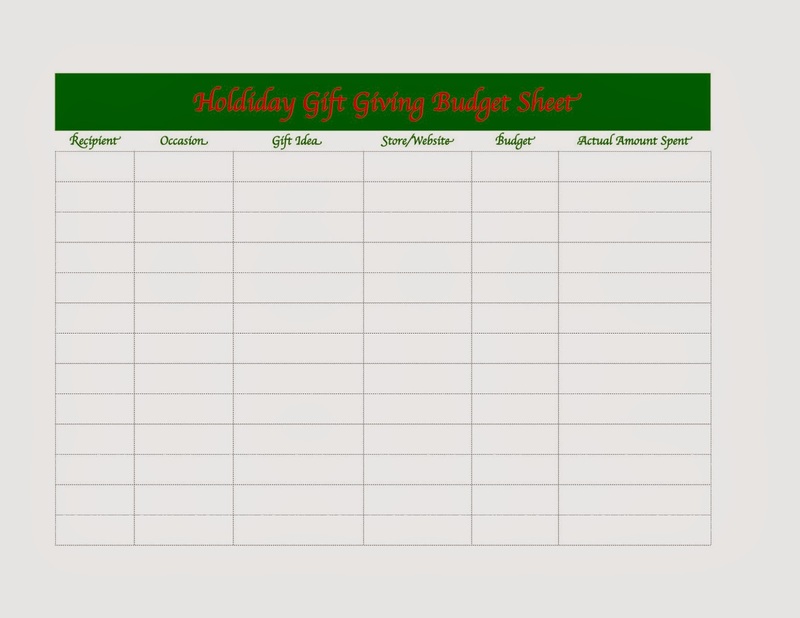 Anytime I think of a great gift, see something on Pinterest or in a store I add it to the spreadsheet. If I know the dollar amount or store I also add that to the spreadsheet. It is nothing fancy, it is just plain functional. 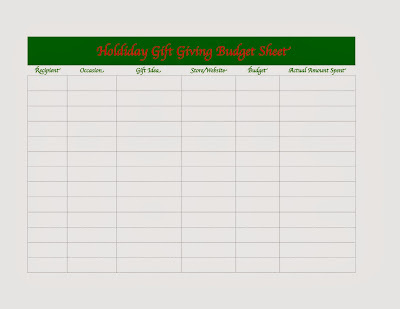 If you think it is something that might help keep your holiday gift giving on budget and organized please feel free to print. I remember a day when I got excited about purchasing new clothes, shoes, or household items. It felt good, there was an adrenaline rush with a good sale, I never gave the purchase a second thought. Well, today I realized those days are long gone. As we walked around, I picked up one ballet flat after another, shocked at the prices. Seriously, $79 for a pair of ballet flats! They don't even stay flat when you take it off your foot, they roll up!!! It hit me that I can't remember the last time I bought a pair of shoes other than tennis shoes or Reef flip flops... Ugh! It is just pathetic. When I found myself getting more and more frustrated with the shoes I decided to hunt for leggings. That was even worse! Again, $70 for a pair of black leggings!!! Now, I know I could find leggings at Wal Mart, but my legs and backside need $70 worth of support. I don't want to feeling like everything is wiggling all of the place. So, I put back the leggings and wondered back to the shoes department. The fourth sales lady asked me if I needed any help. At first, I said no and then asked if I could try on one pair of flats. She brought them out and unwrapped them for me. As I slid one on (never got to the second shoe), I decided they were too narrow. I think she was shocked at my record speed for trying on and making a decision. Wow! The last couple of weeks have been insane! I thought about listing every "extra" activity, fundraiser, field trip, festival, birthday, etc. but it hurts my brain. Let's just say I don't want another season like the last two weeks for awhile. I am a home-body. I prefer to be in my house with my family having a quiet evening (well as quiet as a family of five can be). The good news, the end of November is looking promising... :). One of our activities was a cake auction for my oldest son's Cub Scout pack. This year, all of the proceeds are going to our local children's hospital. We had 22 cakes entered into the auction and raised a nice amount of money for the hospital. I thought I would share some pictures from the cake we entered. The boys also dressed in their Halloween costumes. His just happened to be an astronaut which went great with the Stars and Stripes theme of his cake. This was our first attempt with fondant. There were definitely some rookie mistakes, but overall we was pleased. My son was the brains behind the theme/idea and my husband and I were the manuel labor! I just think these little eagle cupcakes are the cutest things. I wish I could remember the exact location of the idea but I know it was Pinterest. I know what you are thinking...you wish you had that big blue dumpster in the background of your pumpkin patch pictures. Found the prized pumpkin, now lets take it home! Uninterrupted family time is rare and precious these days. We only had about 20 minutes to spare at the pumpkin patch but it was the best 20 minutes of my day. It's my choice, happiness and joy or deceit, distrust, guilt, misery etc. Is life really that simple? Can a person actually make a decision between happiness or misery? I am in the third week of an amazing Bible study by Joyce Meyer (Battlefield of the Mind). I know this sounds dramatic but it has been life changing! Seriously....life changing! I have always viewed myself as a planner (of every single detail), worrier (of every single detail), controller (of every little detail) to the point of anxiety, stress, and the list goes on. I have an amazing life with so much to be thankful for but I always struggle with stress, guilt, the feeling that I am not doing enough, etc. I have actually felt envious of those who seem to be happy all the time. I have prayed to God that I would be happy and "carefree". It seems like some people are just born that way? Why do I have to fret over every little thing while they seem to go through life on a glittering cloud (with a smile on their face). Now, I do feel some people come by it naturally, but I am learning that the rest of us can have that type of life, too. Before this Bible study I would have never believed a statement like that, especially from my own thoughts. I just always figured there were happy people and then there were stressed out people (moi). I thought God had a reason for both kinds of people and one day I would figure out my reason. The way I think (and I have the ability to control my own thoughts) is what I will do and become. Seriously??? Is that right, is it that simple? Thinking good, happy, and praiseworthy thoughts, always thanking God and meditating on his Word, and deciding to live the good life He intended for me to have can and will change my life. Something else to really consider, this will not only change my life but the life of my family. What kind of legacy do I want to leave for my children and grandchildren. How I act and respond to life is how my children will act and respond to life as adults. Now that is a light bulb moment that gets my attention! I am making the choice! I know not every day is going to be easy. But I know that I have the power to make the choice and above everything else, I know that God is on my side and has an amazing life just for me. This week I was pleasantly surprised by two pieces of mail! Two of my dear friends blessed me with lovely hand written cards. What a special treat! Both of these ladies are very busy and they took the time out of their schedules to write a note to me. It made me feel so special. I want to make others feel the same way. As women, we should constantly love on one another. Keeping our daily endurance up is much easier (and pleasant) when we have received a little encouragement and support. Let's bless one another by taking the time to write a short little note. An email, text, or phone call is also nice but there is nothing like a handwritten note. I am going to make a commitment to write one note a week and send it to a friend, loved one, or any woman I think needs a little love and encouragement. If you would like to join in the fun that would be amazing. Just think of how many women we can blessed through small notes of encouragement. It is the little things that go such a long way. Below are just a few Bible verses I feel are full of encouragement and support for women. Have a fantastic Friday and be a blessing to someone! I love this verse. It has really helped me through stressful moments and transitions in my life. When I was teaching, I kept this verse taped to my computer. Whenever the days seemed to be too much, I would read over it. I would use it as a "check list" to refocus my attention and gain perspective. Yesterday morning at Bible study, we discussed this verse. It is so important as women (and especially mothers) that we remain focused on what is truly important. We are currently studying, "Battlefield of the Mind" by Joyce Meyer. I highly recommend it. It is a quick read and addresses many of the strongholds we have as women, wives, and mothers. Joyce Meyer reminds us that God never intended for our mind to be constantly overloaded. We will not be able to hear what God is trying to reveal to us if our mind is busy and constantly thinking, over analyzing, etc. etc. We are only a third of the way through the book but it has already been a huge eye opener. 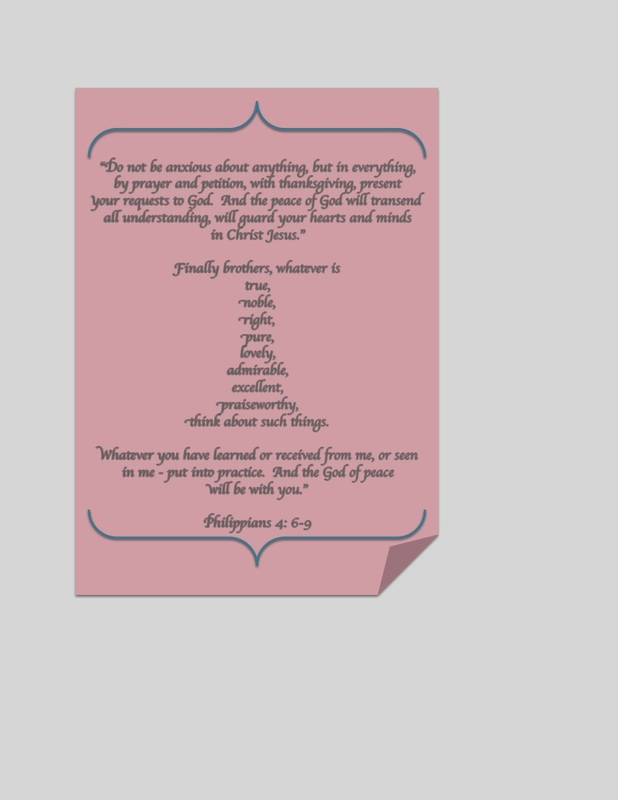 Philippians 4: 6-9 is a great part of scripture to memorize. It really can be used as a check list. If what is consuming your mind does not fit into this scripture then it needs to be removed from your priorities. As mothers and wives, we have too much on our plates to also deal with things that are not true, noble, right, pure, lovely, admirable, excellent or praiseworthy. I know it seems so black and white, cut and dry but it really can and should be that way. God does not want us to worry and fret over things we cannot control or that are not healthy for ourselves or our families. 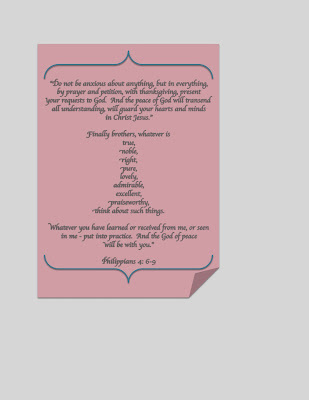 Since I think of this scripture as a check list, I thought it would be fun (and helpful) to make a printable. Feel free to print your own copy.